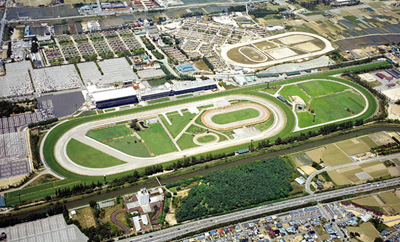 Niigata racecourse is located in Niigata City alongside of the Japan Sea. 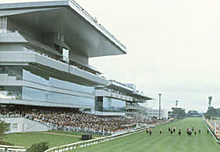 This racecourse was completely renovated in 2001. The major races are the Sekiya Kinen (G3), the Niigata Kinen (G3), the Niigata Daishoten (G3), the Ibis Summer Dash (G3), the Leopard Stakes (G3), the Niigata Nisai Stakes (G3) and the Niigata Jump Stakes (J-G3). Approx. 40 minutes by nonstop bus leaving in front of JR Niigata Station. Approx. 30 minutes by bus from JR Shibata Station. Approx. 15 minutes by nonstop bus from JR Toyosaka Station. Approx. 20 minutes by car from Niigata Airport.